Tiny fruits but more flavoursome. 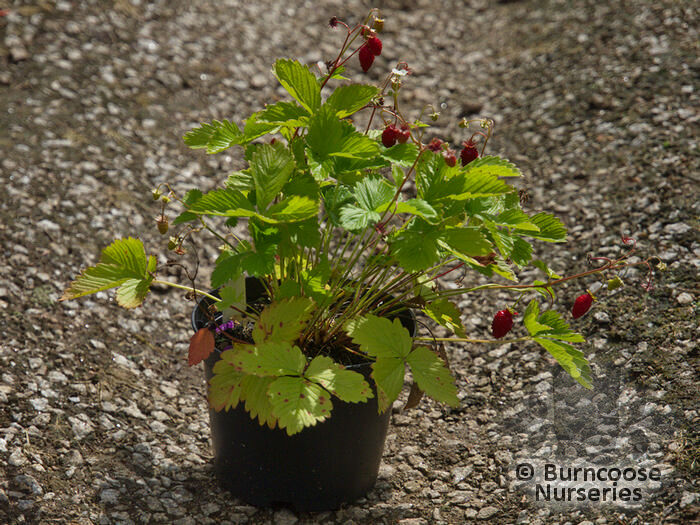 The Alpine strawberry. Genus of 12 species of stoloniferous perennials from open woodland, hedgerows and grassy places in Europe, Asia (as far as southern India), North America and temperate areas of Chile. 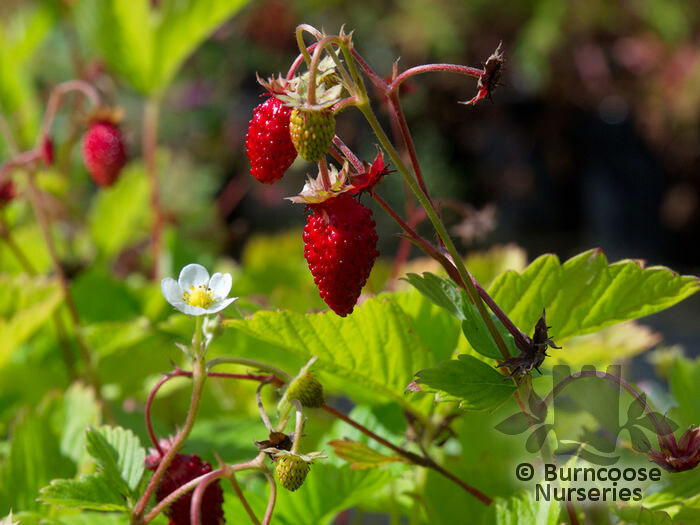 The native wild, or wood, strawberry is found in dry grassland and woods, is smaller than the Alpine strawberry usually supplied by nurseries and fruits over a shorter period. Semi-evergreen - Keeps some of its foliage all year, and will drop some leaves as well. - rosettes of 3-palmate, bright green leaves with oval, toothed leaflets 5-7cm (2-2¾in) long. Fruit - Plants which produce an edible or ornamental fruit - stoloniferous perennial. Rosettes of 3-palmate, brighsmall flowers, to 2cm (¾in) across, with 5 rounded petals are followed by sweet, slightly scented fruit. Additional Features	- Good to know - wildlife plant - birds and small mammals. Medicinal properties - dried leaves make an excellent tea substitute. Pests & Diseases - vine weevil grubs, leaf spot, powdery mildew, honey fungus. Neutral to alkaline soil - will tolerate all but most acid soil.